Amelie Böckheler was born into a musical family in Munich in 1992 and was seven when she began to study the violin. From 2006 to 2010 she was a pupil of Nicolas Koeckert and in 2010 she enrolled in the class of Ingolf Turban and his assistant Key-Thomas Märkl at the University of Music and Performing Arts in Munich, completing her bachelor’s degree with distinction in 2015 and beginning to study for a master’s degree. 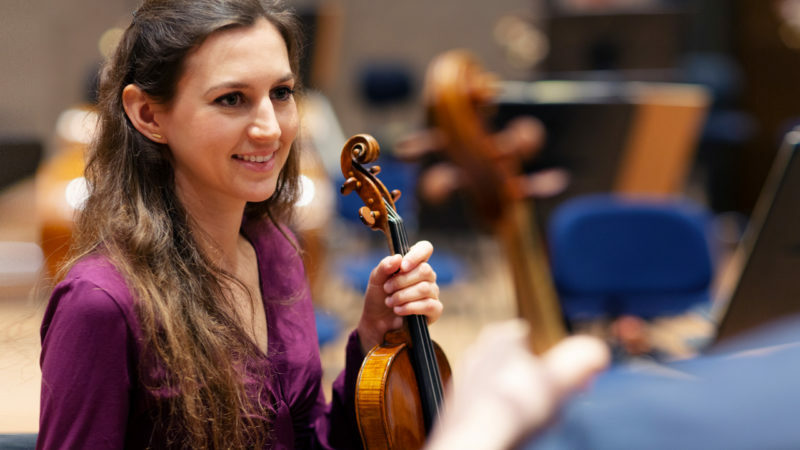 During this time she has also attended masterclasses with Zakhar Bron, Ana Chumachenco and Ivry Gitlis. In 2016 she enrolled at the Academy of the Bavarian Radio Symphony Orchestra and two years later joined the orchestra’s second-violin section. Amelie Böckheler has received many first prizes for her violin playing, notably at the Jugend Musizert Federal Competition and the WDR 3 Classical Music Award of the City of Münster. For a number of years the German Foundation for Musical Life arranged for her to borrow a Nicolò Gagliano violin from the Foundation’s collection of musical instruments. As part of Duo Servais with the violoncellist Raphaela Gromes she won first prizes in the Chamber Music category at the Gasteig Cultural Circle Music Awards and at the Fiorindo International Music Competition in Turin. As a soloist Amelie Böckheler has appeared with the Bad Reichenhall Philharmonic and other ensembles in a repertory that includes the violin concertos of Mozart, Mendelssohn, Sibelius and Paganini and Brahms’s Double Concerto. Her deep and abiding interest in chamber music, which she performs in various formations, has taken her to numerous music festivals and concert series, including the Edinburgh International Festival and Schloss Elmau.